By choosing these galvanized landscape, gardening, and sod staples, you won't have the problem of rapid rusting that other buyers experience when they buy inferior non-galvanized staples. 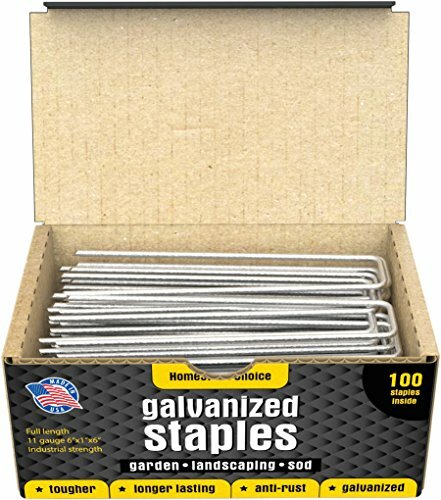 High quality, USA-Made products like these 6" galvanized garden staples are a joy to work with. And, because they're galvanized, they'll last much longer without getting rusty, and they'll keep doing the job they were intended to do. Because they're also manufactured to exacting standards, they'll always be the right size and you know that you're getting a USA-Made high quality product at a great price. You also know that your satisfaction is guaranteed, and if you're not totally satisfied with what is shipped to you, you can either return it for a full refund or just request a replacement. In either case, you'll be happy. These staples are perfect for holding down sod or landscaping fabric on hills, mounds, and curves, anchoring wire to the ground for plant and animal cages and even fences, for use with garden ornaments or decorations, for installing and securing landscape edging, water and drip soaker hoses, and much more. CORRECT SIZE, EVERY TIME - the unique manufacturing process used to make these staples means that each piece is the correct size, each and every time. Combine that with the fact they're galvanized 11-guage wire, and you've got yourself a top-quality pack of USA-Made landscaping and garden staples. Napco Metal Leaf Vine and Birds Trellis, 62"
Coral Coast Coral Coast Acropolis Extra Wide Metal Arbor, Iron, 56W x 12D x 79H in.